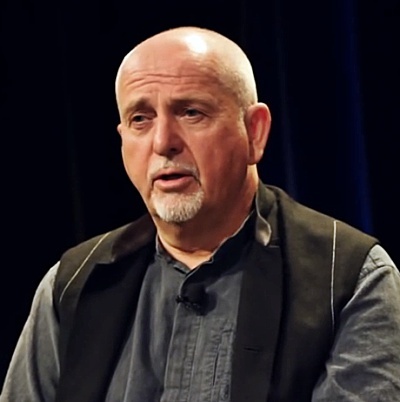 It's not easy being a Peter Gabriel fan in 2018. He hasn't released an album of original tunes since 2002's Up, even if he's supposedly been picking away at a follow-up called I/O since 2005. He refuses to put his music on Spotify and surely plays no small roll in keeping the 1974 Genesis double LP masterpiece The Lamb Lies Down on Broadway off there, too. He pops his head to the surface every couple of years for a brief tour, but he's very far from the pop culture radar and today most people know him for little more than the "Sledgehammer" video and the "In Your Eyes" scene in Say Anything. It didn't used to be like this. Back in the 1970s, Gabriel worked like a maniac by get Genesis off the ground, and then walked away right as they started to get some traction in 1975. Working within the confines of a rock band simply didn't fit with his restless, controlling nature. He went solo in 1977 with a series of bold, ambitious albums that didn't sound even a tiny thing like his work in Genesis. It seemed like a dumb career move when Phil Collins turned the band into a stadium-packing, pop juggernaut, but everyone stopped second-guessing him in 1986 when So produced hit after hit and turned him into an unlikely MTV superstar. He's kept his music off Spotify due to an intense distaste for their business model, but he doesn't seem to have any problem with YouTube posting pretty much every bit of music he's ever created. Here's an incredible video of him performing on Kate Bush's 1979 Christmas Special. He was deep into the recording process of his third LP by this point, but he opted to play a haunting rendition of the 1977's "Here Comes the Flood" on the piano. He's usually accompanied by a large band when he plays live, but this shows he's just as spellbinding completely alone on the stage. Watch Peter Gabriel sing his 1977 classic "Here Comes The Flood" at a Kate Bush Christmas special in 1979. Gabriel turns 68 this week. There's no sign that he's anywhere close to releasing a new album. He hasn't played live since the Sting tour wrapped up July 24th, 2016 in Edmonton, Canada. That was a big night for Gabriel fans since he sang about 90 seconds of "Dancing With the Moonlight Knight," marking the first time he'd done any Genesis song in public since an impromptu rendition of "I Know What I Like" at a 1983 Steve Hackett show. It's doubtful that will lead to a Genesis reunion, but let's all hope he plans on doing something in the next couple of years.